Send Orange Roses Basket to Chennai. Gifts to Chennai. Send Flowers to Chennai. Description : Gift your loved one this beautiful bunch of 50 oranges decorated with green leaves and make their day. The roses are beautifully arranged in a basket. Delivered fresh, budding and ready to bloom they are exceptional gifts for your loved ones in Chennai. 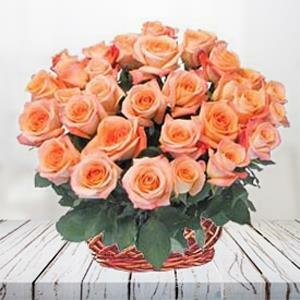 You can also send Gifts to Chennai along with this rose basket through Gift2Chennai.com.